A hip roof is also great to have in hurricane regions. It holds up much better to high winds. In areas like the Gulf Coast of the Southeastern United States, that are subject to high wind loadings and strict construction codes this could be a factor in deciding which type of roof to build. If the slope of the roof from horizontal is 35 degrees or greater it will reduce/eliminate the airfoil effect of extreme high winds that blow over the roof and a hip roof is far less likely to peel off the house than a gable end roof. To this end, since 2001 the State of Florida has required windstorm insurance companies to offer a premium discount to customers who can prove they have a hip roof, which they do by obtaining a windstorm inspection. The hip roof also exhibits increased survivability in tornadic winds and huricanes. Another advantage of a hip roof is that it has eaves all round. These protect the walls from the weather and help to shade the walls (and the windows in them) from the sun, thus reducing the power needed to cool the structure in warm climates. A gable roof does not shade the walls at the gables. 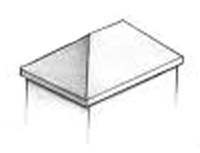 A possible disadvantage of a hip roof, compared with a gable roof on the same plan, is that there is less room inside the attic space. Access is more difficult for maintenance. Another kind of roof to note is Lean to.